Animal welfare » So sad, but what did it? My Chicken Ginger has been killed. 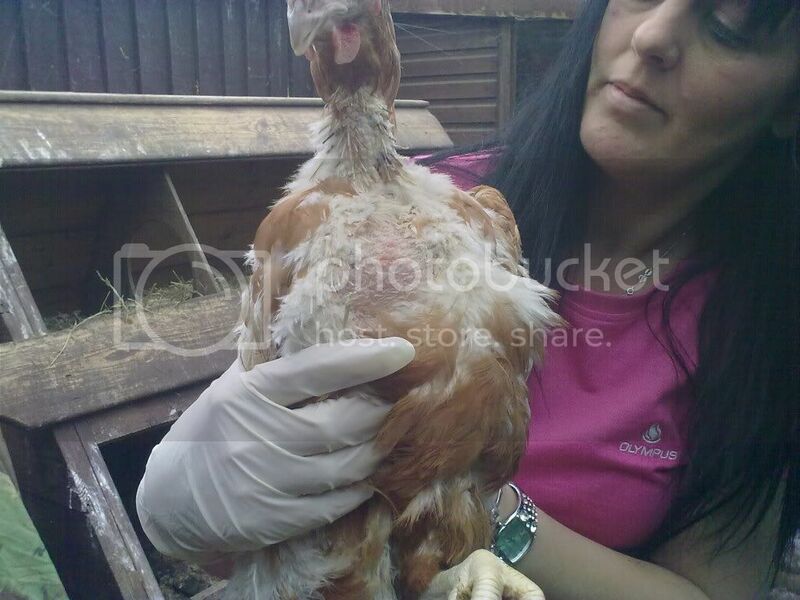 This moring i found her on the floor, Her Neck all bloodly and cut, DEAD. She also had a cut on her leg. What has killed her, there is a few small holes around the side of the hen house, but nothing big, So i dont think it was a fox, as i thought foxess, made feathurs everywhere. This is so sad, I asked my friend to come over, She was so shocked when i showed her, I not falling out with her over it, as she didnt mean to do this, She got very upset with what she did. It might have been a fox who couldn't quite drag her out of the coop. So sorry, Sara. These things happen, but they're horrible - a lot of us have been there. Unfortunately Mother Nature can be a bit of a cow sometimes...Thinking of you . Sara I am so very sorry to here about Ginger this is the worse thing to happen for all of us it worries the hell out of me. Oh no Sara, I'm so very sorry to hear about your little Ginger hen. I know how much it hurts to loose one, like that. Sometimes no matter how hard you try to keep them safe, something dreadful happens anyway. I'd make sure to block off any holes, even little ones, that you see. That's an awful thing to happen. It's horrible but so easily happens. It could have been something a little smaller than a fox like a stoat / weasel that killed it but couldn't take her...?? I'm so sorry Sara. I bet your friend is very upset about what happened. I don't even know if this is possible, but could she have been trying to get into the coop and got her neck stuck in the wire or whatever you surround it with, and then panicked trying to get out and hurt herself? Whatever it was, it must have been a terrible thing to come home to. I think i have photo somewhere of there houses. 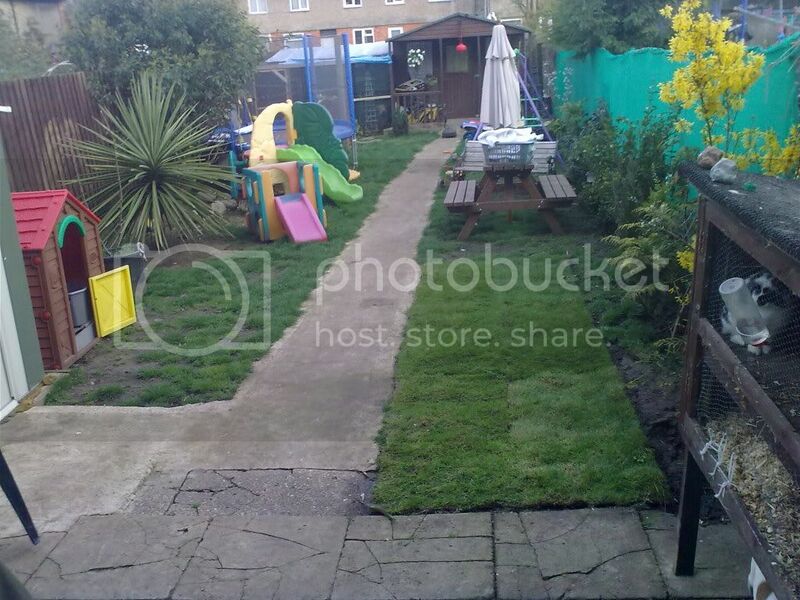 We have just put ginger in our little place of rest in the garden, Arthur said she was be sleeping as she is still, How a 4 yr olds mind works, He did like jumping on the soil to make it hard afterwards, then he placed a stone on top, and a can of pop,(dont ask)!!! Anyway hubby says it looks like a rat has killed it, If she was left out and sleep then a bloody big rat as got hold of her my the next and biten her. What a way for her to die, She was the nices out of all my girls. 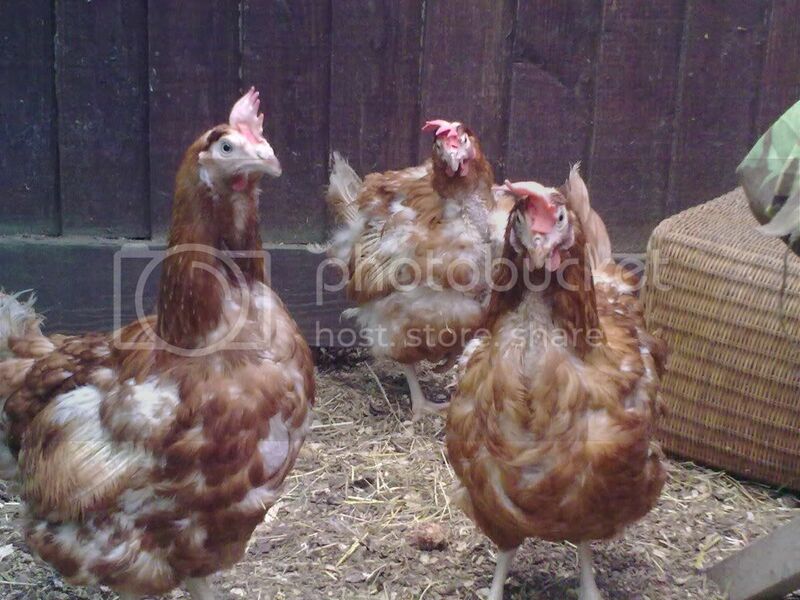 I only have 3 northen reds now, n two banbems, Got to get some more hens. Like to get some battery once, that need loving. Was my birthday on friday. n went away to the seaside and stay in guest house. I have a few pets so i have to get someone to help me look after them when im away. This is the outside, This piture is taken before it was finshed, but you can see it has had to go threw this then threw the other, so if she was left oput, it was easy for her to be killed. Gona lay some traps down..... Sorry to all you rat lovers, but this rat ant my friend... And if it isnt a rat well... i'll have to think again. might get CCTV IN THERE!!! Be careful what you put in traps Sara - they have a habit of not getting what they are aimed at and with your many pets and the kids you need to be careful, especially if you are considering poison. There are humane traps if you are prepared to take them off somewhere and release them? I love my pet rats but wouldn't want any wild ones living in my garden! Bit like Red and her cockroaches - pet ones in a case are OK but she wouldn't want a colony in the kitchen I'm sure! kateb.they will not be able to be set free.hubby put a trap down.away from everythin,so up setting. Sad news, Sara sorry to hear about poor Ginger. 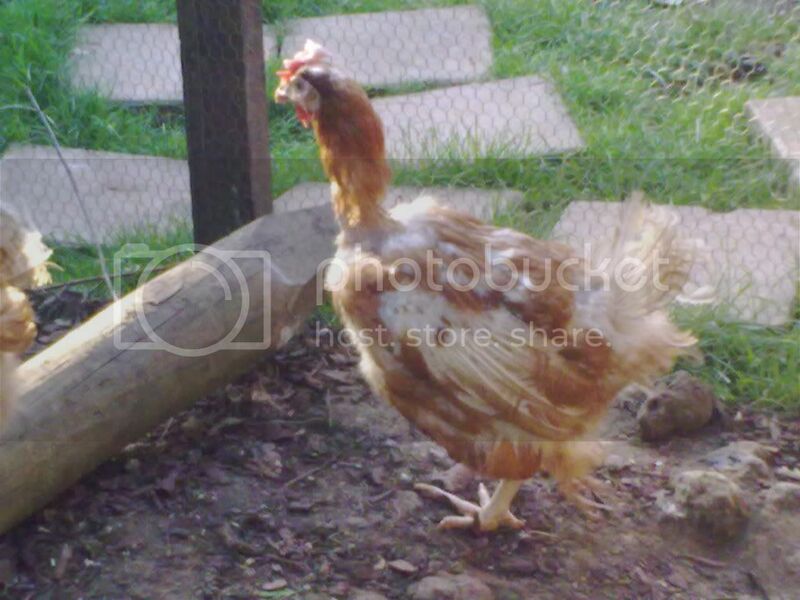 I have phoned BHWT and im getting 3 battery hens on the 11th April, Ive not had recused before, So any info i'd be happy for it. I know they will be in a state and very scared. 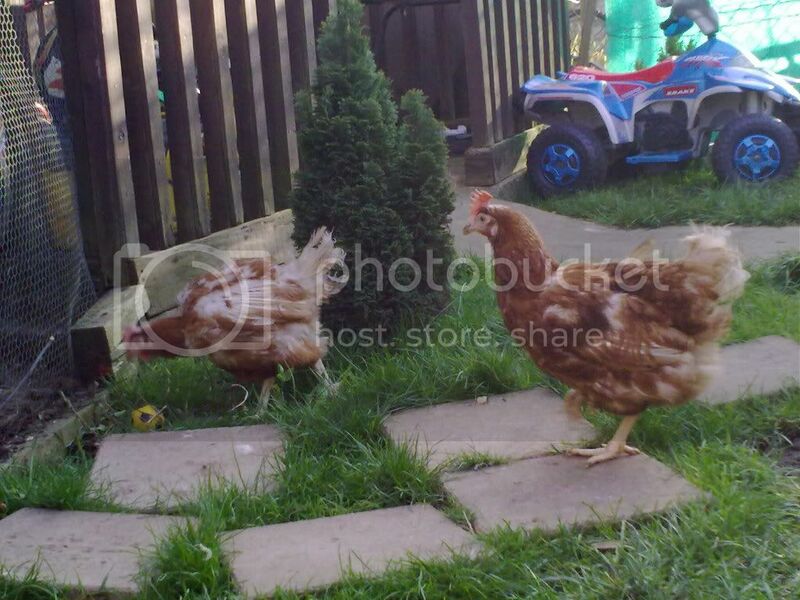 Posted By: sara I have phoned BHWT and im getting 3 battery hens on the 11th April, Ive not had recused before, So any info i'd be happy for it. Sorry it's taken so long to reply!! http://batteryhens.co.uk/ ~ you can have a look at that site if you want. 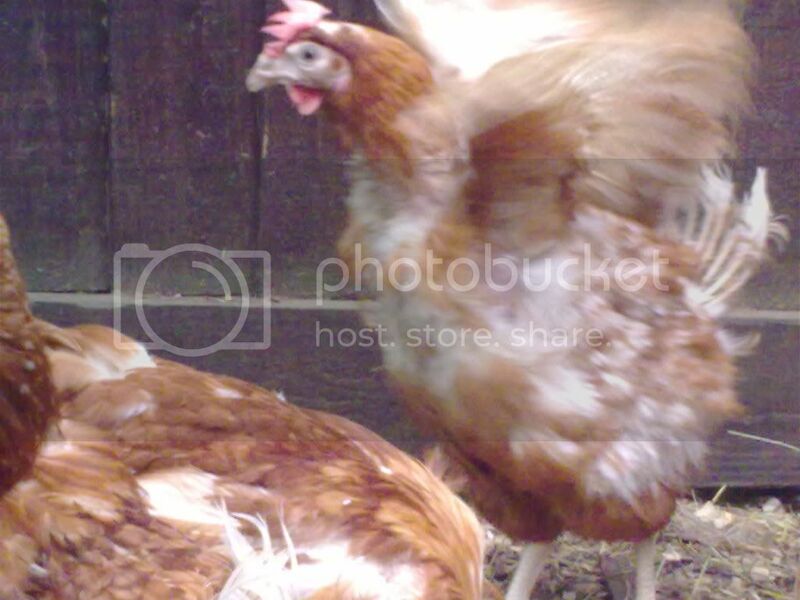 It has a short video of Eva, my ex-bat, on it and there's some info on battery hens on there too. You don't need to know too much I don't think, really. Just go easy with them, make sure they don't get too intimidated and bullied by your other girls (are you gonna keep you new girls separate from your existing girls for a while so they can grow in confidence?) Watch them in extreme weather, such as strong sunshine, lots of rain or very low temperatures. The ones with few feathers may need a coat for when it's cold and sun-cream for when it's too sunny. Keep an eye on their beaks to make sure they can eat with them (they will almost certainly have been de-beaked so the top beak will be shorter than the bottom, which can rarely cause trouble eating). When feeding treats, teach them that it is food by ripping it into small bits and dropping it repeatedly in front of them. Spend as much time in the coop as you can with them. Leave them alone for a day or two to settle, then spend as much as poss in there reading, talking to them, feeding them from hand etc. If they are anything like Eva they will tame in no time! If you have perches in their bedroom, make sure they are able to get onto them - a lot of ex-bats aren't able to jump onto perches at first because their leg muscles are very weak due to not being used to exercise. I can't imagine a rat would kill a fully grown hen? There was one animal I forget what it is, but it will just bite the heads off a single hen each night, keep coming back until you have no more, can't remember what it was though so not much help there! 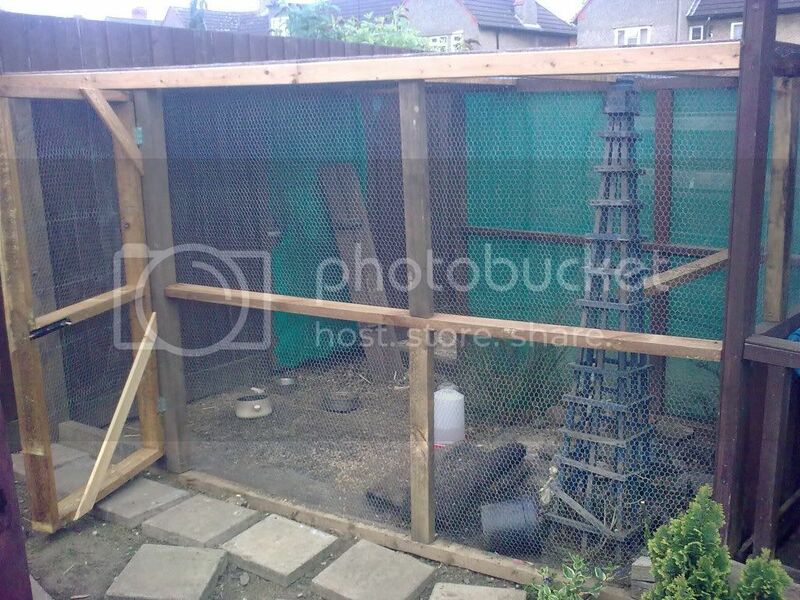 If it's digging under the coop then chicken wire on the bottom and out along the ground should stop it, although it should really go into the soil for a couple of feet to stop foxes digging under. sun-cream for when it's too sunny? what kind? as we have the sun at the moment, not like they will be out in it. No they havent been de-beaked.. so this is good news. Neil I still think a rat, we have a dead rat body.. We think she was left out and asleep and killed. unless something got her befor the rat, But the rat is now dead. Sorry to read about your little hen Sara. How exciting you are having some more and well done on choosing ex bats. You will soon get them all well and comfortable I am sure. They jump when you try and touch them, It really sad, Pictures on way.. The girls new play area..
Well done Sara I will be getting 4 ex bats in a month or so and can,t wait to give them a good life how dose it make you feel now having them after loosing one of yours?? Well done Sara and the good thing is they don't look to bad, with your loving tender care they will soon fluff up and gain their confidence. It is so nice that they haven't had the pain of being debeaked as well. 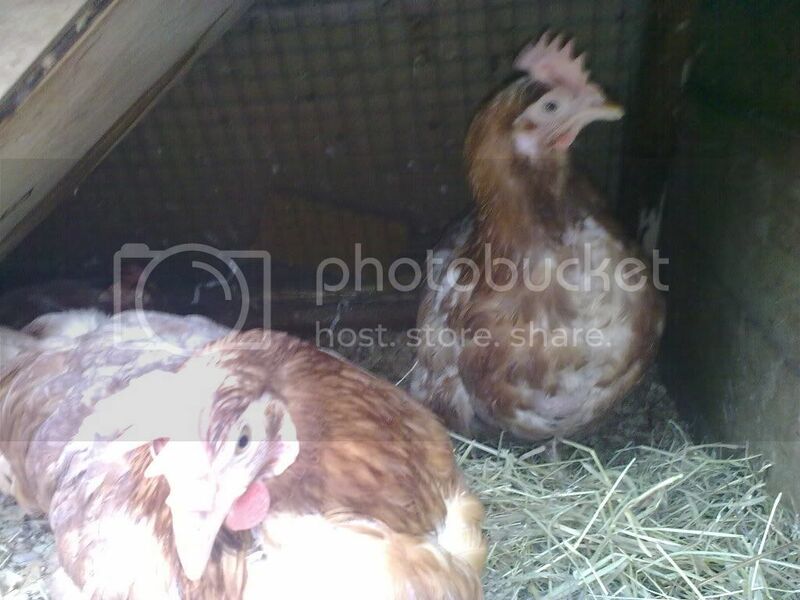 It's always a very good idea to keep new chickens enclosed in their house/run for a few days. This way they learn that this is their 'home' and they'll return there to roost at night by themselves. Neil i do beleive i have 3 lazy hens, As when it comes to bedtime they sit on the top of there inside house, my daughter has to put them to bed everynight, the bantems are fine they go to bed by them self, We have to close the front board anyway so they are used to being picked up and put to bed, Its just when we go away for the weekend and ask friend to put them away they left one out, i sillyly forgot to tell them how many we had, so ginger was left out and died. I do feel happy i have my new girls. DAY 2. they are alright still hiding behind there cardoard, They have eaten all there food i gave them. I put a 7 sweet corns in a dish. whata alught. they looked at them first them, picked one up and dropped it again, took about 5mins to eat one small sweetcorn. i'll give them something eles at the end of the week. They did lay an egg, But i dont think i'll be eating that. i may break it open just to see how Not yellow it is or isnt..
My girls want to know what happening, they keep shouting to the new girls. Id love to know what they are saying to each other. But all is well. Hurray, oh they are so lovely! Bless them, poor little sods. Glad they are settled in well. How are they around people, are they calming down a little? If they have access to shade, I wouldn't worry too much about sun cream - it's the hens with more skin than feathers showing that I think you only need to put cream on. Also, you can add grit to their feed (just a handful or so) and this will basically help them digest all these new exciting foods they will be eating at their new home! Congrats on your new girls, they are so lovely. Keep us updated! Bless them...you're so good to give them a home Sara, what with your tribe and all! Well done Sara - I hope your girls settle in well and give you a lot of pleasure. Its so lovely that you have given them a new home where they can be safe and wander free. 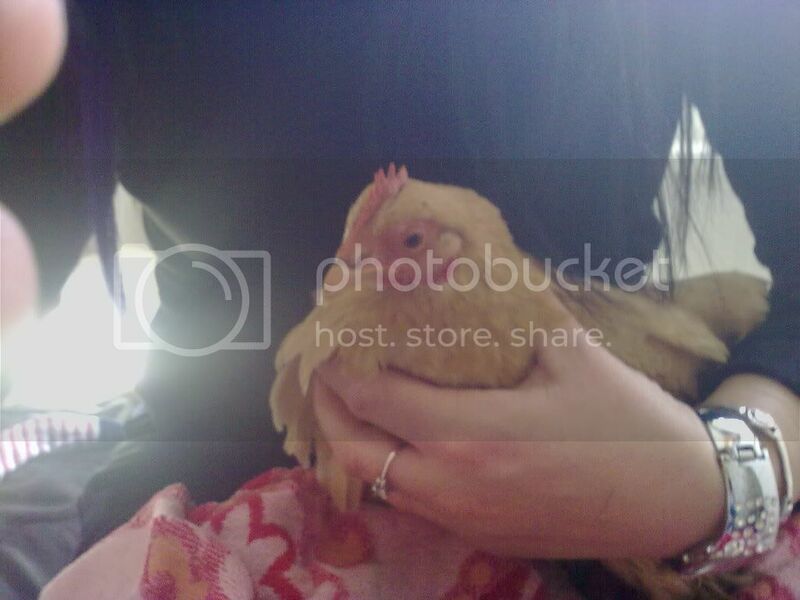 oh bless you sara, so glad to see the hens have a new safe home. I fel quite teary looking at the poor loves but they will soon grow stronger and have nice new feathers. If not, then NN will have to get knitting vests! How are they today, Sara? They have enough feathers to keep warm CC and they are on hay which will be nice for keeping the heat in. I would have made Sarah some if she had the hens at the start of the winter. I did have someone called Angel asking me to make some, and said I would for a donation to little hen rescue. I had a feeling she wanted them as a fashion thing for her hens so was very reluctant. Any how she never made a donation to them so I didnt make her any !!!! Yes they are doing really well, they have been give grit and they have had some yoghurt, vegetables, grains. and grass and sweet corn, They look at it first, try abit and go off to think about it, then return to take a little. Yesterday i thought i would take them out of there inside hut, as they were not doing this them self. they had been in there since last sunday. So i reached in and picked them up. One of the girls just attacks you. Its doesnt hurt. I put them all on the floor, outside there hut, but still inside the main hen house.Keeping the other girls on the outer run. This is fenched off. So they can see each other. Well the new girls just stood there they kept opening there wings and flapping. So sweet to watch, Then they started to walk around, they walk diffently to my other hens, They have longer feet, and curl there toes up when they walk. So i let them stay outside, for an hour. When i went back to see how they where. I couldnt find them at first. 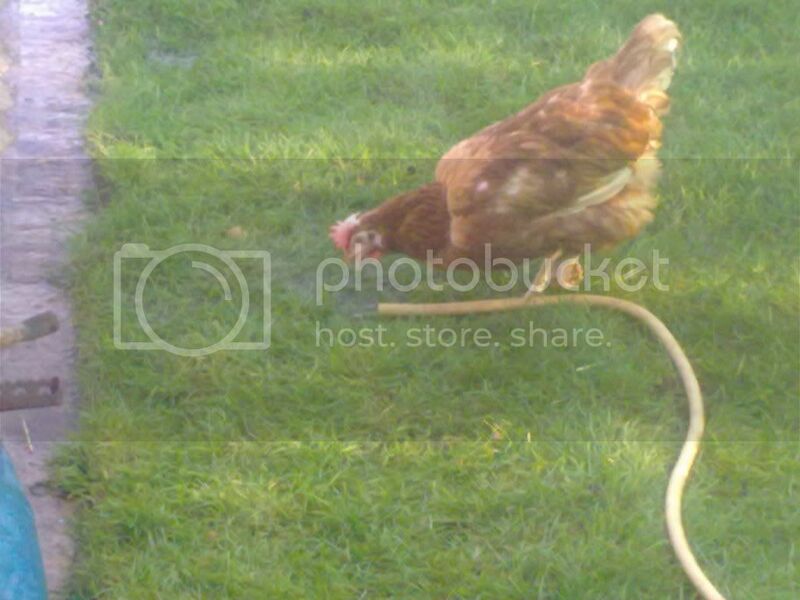 I found this out one day when i had forgot to move it.. Now she waits for me to put it there before laying her egg.. Anyway i picked them all up and put them to bed. 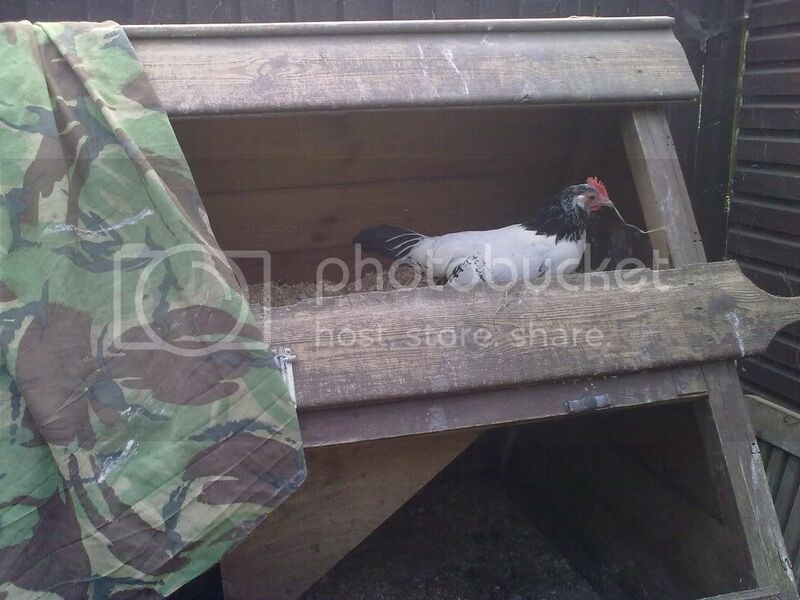 One day Two i noice they where trying to sit on this bit of cardboard, So i got an old broom handle and put it threw the hut, So they can sit on it, My girls dont do this, But the new hen like to be off the floor. Today. 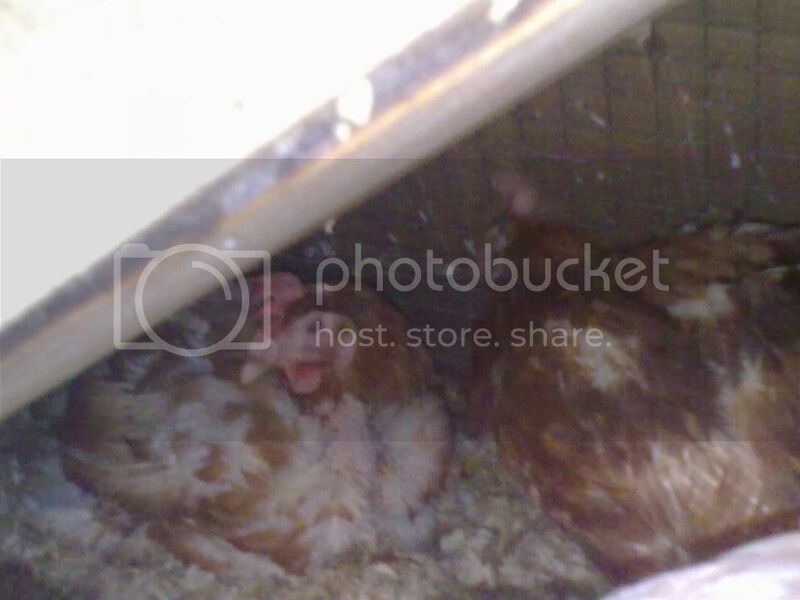 I again lifted them out as they dont want to do this by themselfs., They keep looking like they are going to but i wait till 3pm and they are still sitting in there hut. So i lifted them out. But today i left the inside and outside door open,So they could meet my girls and if they wanted come outside. Yes big steps but i was sat in the garden with them, so i was on hand if there was any fighting or anything. Well i was expecting at least a little kick of. Nothing. They just took at look at each other and carryed on. My girls came out for there roam around and the new ones, went roaming around the outside pen. After about 30mis. The new girls took steps outside into my garden, Where they started to eat the grass, So so nice to watch, I could beleive them, Only 2 out of the 3 came out.They only came out for about 3mins if that. Then i had to go and do some jobs, When i returned about an hour later. O it was so sad to see. I even called my hubby. I have a rabbit hut inside my chicken house, Some of the girls use it to lay in. Well they where all inside it, But they where all sat where the wire is and all together, so sad. They had so much space to run around, but choosen, to sit in a small hut. Thats what they are used to. Anyway i put them to bed, We will try agian tomorrow. I dont think they are to impressed with my singing. I love this detailed commentary on the progress these girls are making. Keep it coming Sara please. 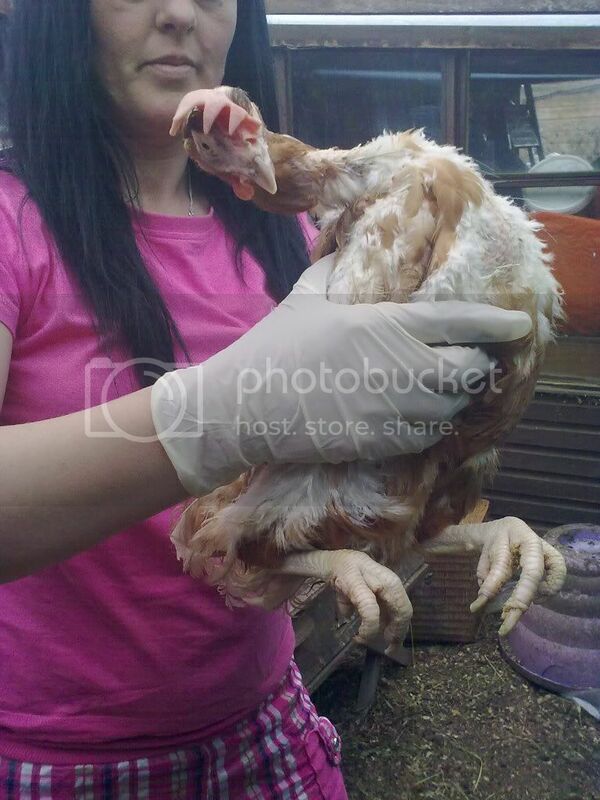 Wow Sara how much more alert your new hens look, they have brighter eyes and are holding their little heads higher. What a difference you have made to them already. You are instinctivly being a real mother hen to them with lots of love and encouragement. Well done love I am real proud of you. Please keep all the news about them comming as it will certainly be of benefit to others who might be a bit afraid to have battery hens. Plus it is real good to share every thing with you even though it is from afar. They've come on enormously since you first had them, Sara; much brighter of eye! Keep up the fantastic work, you heroine you! I can only agree with everything said already! Your updates are wonderful and such mixed emotions for the poor things. Hopefully with the love and encouragement you're giving them they will forget their previous life soon and enjoy their new found freedom. 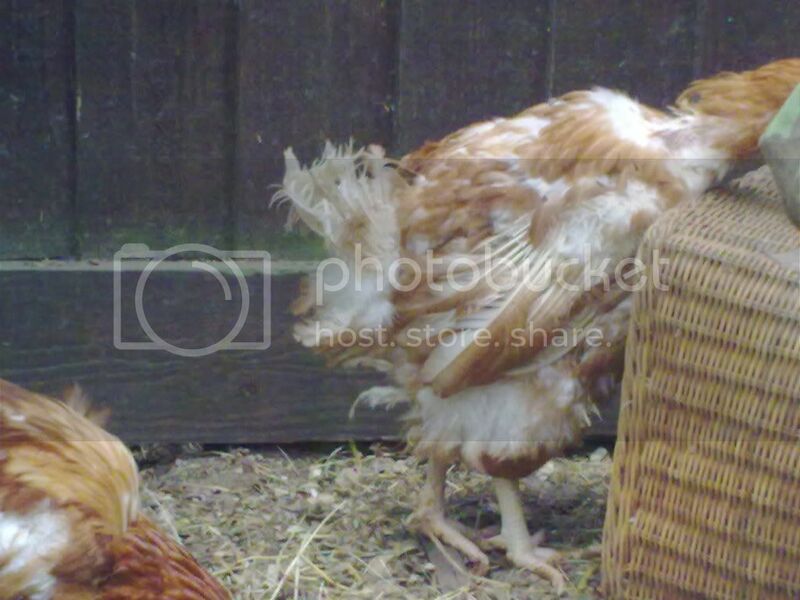 Look at the state of that chicken above, Thats Jewie,The one with hardly any feathers, Then above her is ann franks. Dont ask my daughter named them. She is the bravest out of all of them. Then bottom right is yellow head, one my old girlys. Above they are out, They walked out of the main pen into the garden, Where they met my two dogs and the water pipe. Ok this is no joke. look at this..
Look how long her toes are, And they are so white. But gosh she so sweet, love them to bits. Above is the same battery hen, she just loves fresh water. 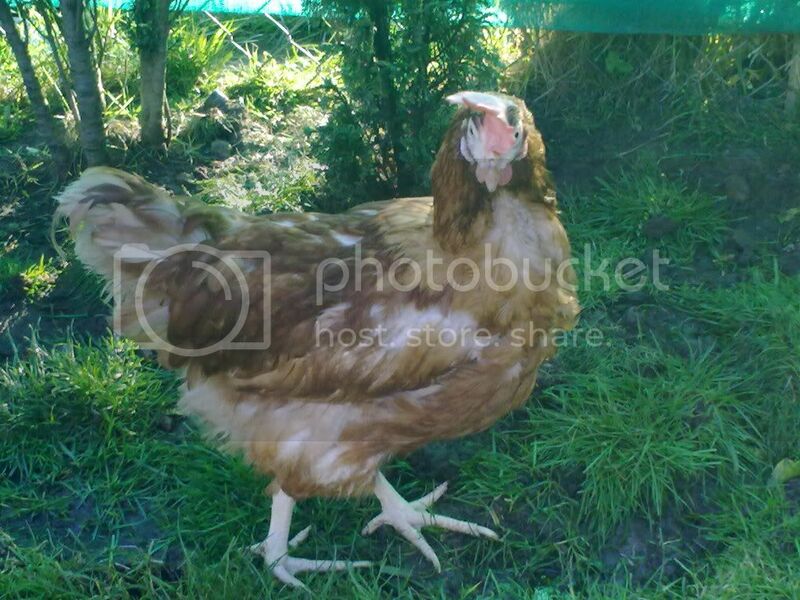 This above is my little lady, This is the one i was telling you about, how she likes to lay an egg behind the fabric. Thats the same fabric the new girls coverd themselfs in. She loves the new hens, She was the 1st to say hello to them. Oh Sara what a joy to see them all so happy and enjoying themselves. You can even see the wonder and delight on their faces. You sure are right about their long feet !!! 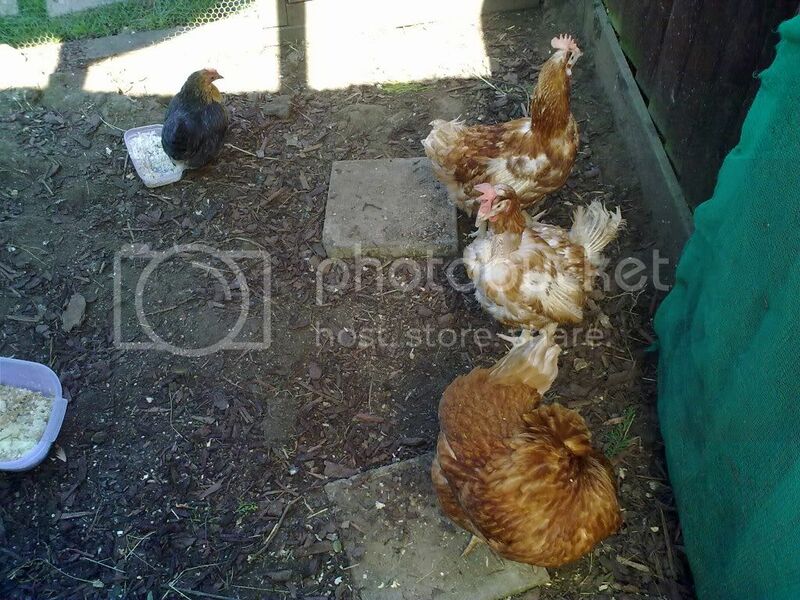 Their legs and combs should colour up with good food and sunlight, they will soon get beautiful new feathers also. Well done love you have done wonders with them in such a short time. Once we were caged, Now we are free. Watch us grow and be happy!!!! Excellent Sara sums it all up you should be very proud at what you have achieved!!! Maybe you should call her "Sara's Mirror"
Well done Sarah - they look like different birds, their whole demeanour has changed, and they seem very relaxed. You should be very proud, girl! 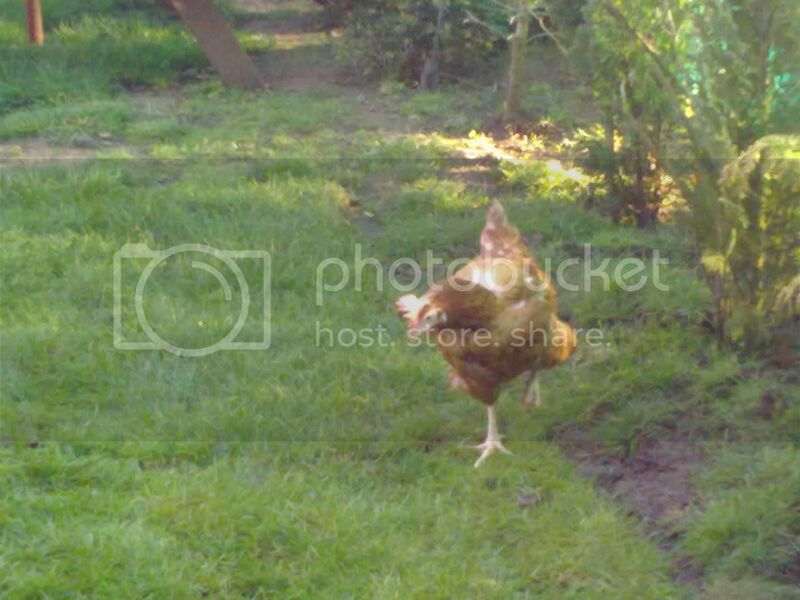 Another day of hens playing in the garden, My daughter brought the boyfriend around for the first time, They went into garden for lunch, I put lunch on the sitting bench and the boyfriend shouts to Charlotte and i while we was in the kitchen, How do i get the chickens of the bench.What a wally. There is still on hen jewie who is still staying near the outer pen door. But she did come and have some creamy pasta with all the other hens. 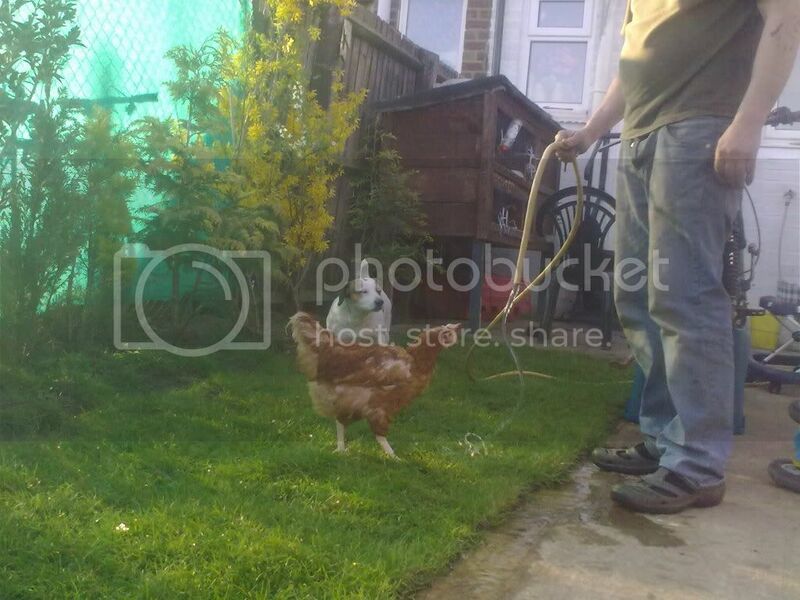 And Annie has had her fresh water from the hose pipe. Poor Lad a lot of people are nervous of hens it is the look of that sharp beak and beady eye that does it !!! 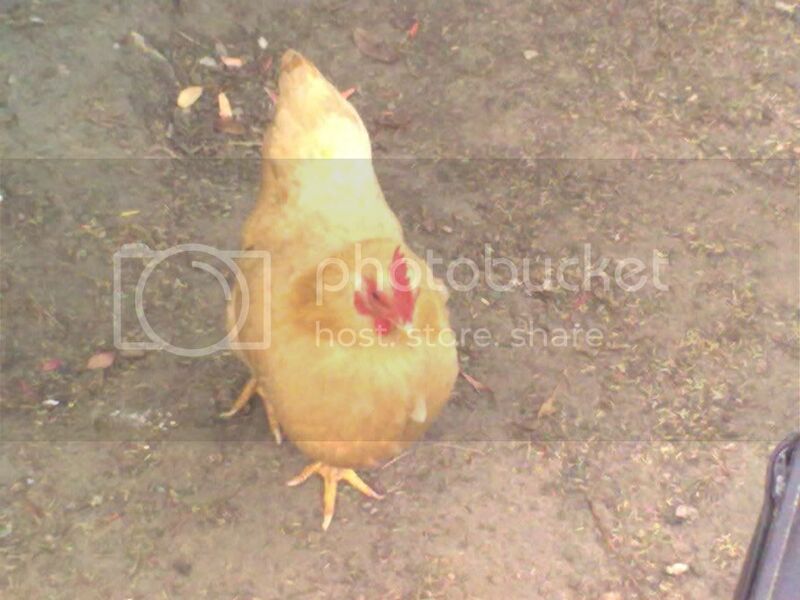 I got pecked by one once and it drew blood and hurt for days. 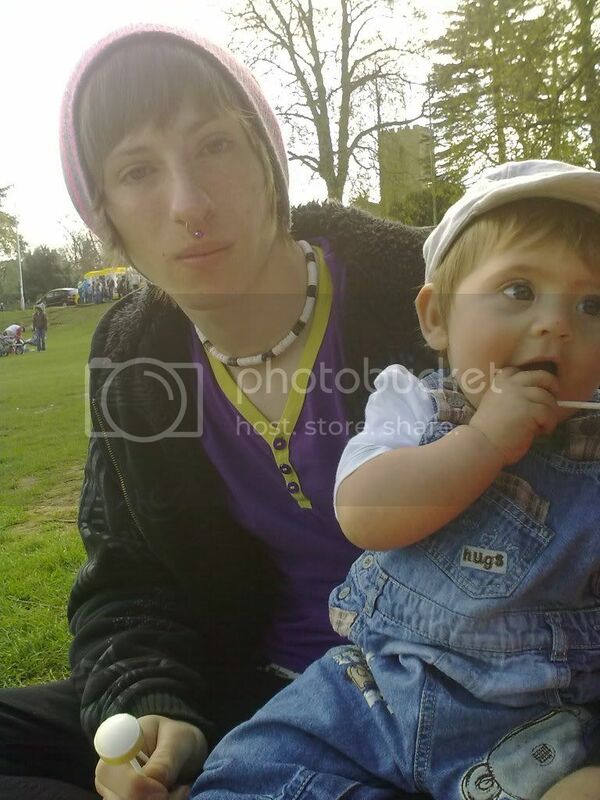 Poor lad, the boy has a bull ring threw the center of his nose, he's also 16.Tough enough to say get down. I think because i love them so, he didnt want to shew them and upset me. he nice lad. 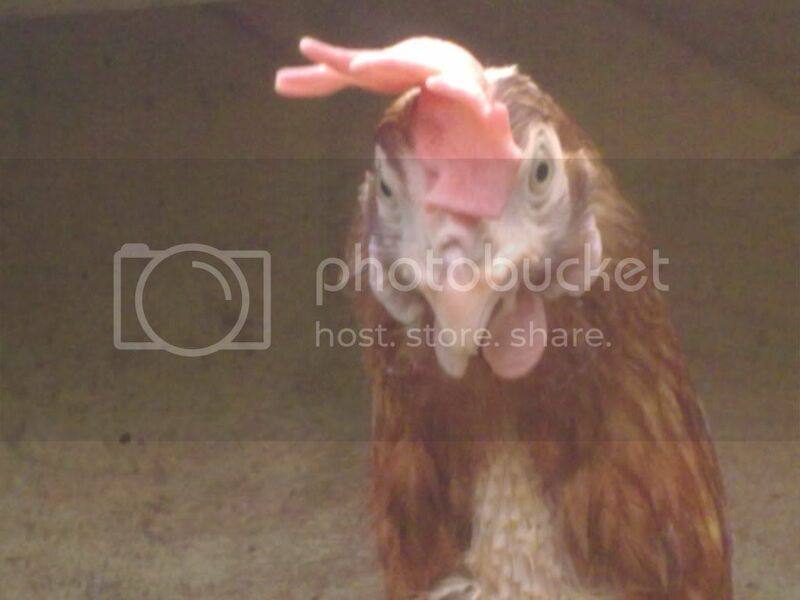 You can see now why your chickens like him with that lovely shiny ring!!!!!!!!!! LOL,. Yes indeed. your funny..